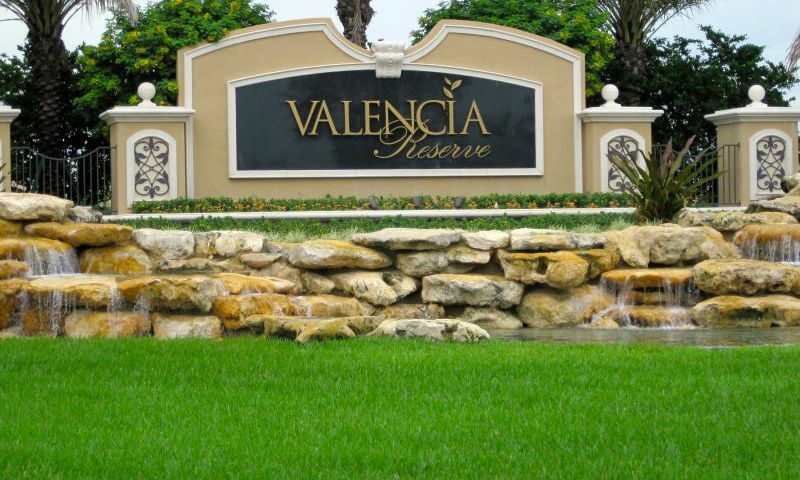 Valencia Reserve by GL Homes is one of the finest active adult communities in southeast Florida. This gated community, open to adults aged 55 or better, is situated in beautiful Boynton Beach. The suburban location has easy access to major airports and is close to world-class shopping and great beaches. Valencia Reserve in Boynton Beach is one of the popular Valencia active adult communities in the region. GL Homes offers an excellent selection of customizable single-family floor plans with the latest upgrades and sought after high-end finishes sure to appeal to even the most discriminating homebuyers. In addition, lots of natural vegetation and a variety of scenic lakes provide for waterfront and nature views for most of the homesites. Nine acres are set aside on the Valencia Reserve grounds for the spectacular 41,000 square-foot clubhouse that features a grand assortment of amenities. Indoors, this opulent lifestyle center includes a massive grand ballroom with a stage, a state-of-the-art fitness center, a spacious aerobics studio, an arts and crafts studio, multiple card rooms and a game room. Outdoors, residents of Valencia Reserve enjoy multiple pools on a large patio. Residents can swim laps in the lap pool, get some exercise in the resistance pool or soak up some rays by the resort-style pool or relax in the adjacent spa. There are nine tennis courts with shade pavilions, and a basketball court. Valencia Reserve also has a cafe where residents can gather for morning coffee or afternoon lunch with friends and neighbors. GL Homes started construction of this 55+ community in 2009 slated for 1,043 single-family homes and finished the community in 2013. These concrete block houses offer between 1,303 and 2,861 square feet of air-conditioned space. Buyers are able to semi-customize their homes and can choose from 17 floor plans among three different collections. The Signature Collection is ideal for homebuyers who want to enjoy the Valencia Reserve lifestyle on a lower budget. These seven plans offer between 1,303 to 2,396 square feet. The Vintage Collection offers a bit more space with homes between two and four bedrooms and two to four baths. These desirable homes offer from 2,182 to 2,703 square feet. For homebuyers who want the finest in luxury living and plenty of living space, the Crown Collection includes five floor plans ranging from 2,380 to 2,861 square feet. GL Homes offers a nice selection of homesites with excellent waterfront and garden views as well as some of the most desirable upgrades and high-end finishes. Some of these include granite kitchen and master bath countertops, 18" ceramic tile flooring, upgraded wood kitchen cabinetry, and covered patios.Valencia Reserve at Boynton Beach offers a perfect combination of tranquil surroundings, an incredible location and stunning homes for a lifestyle that is second to none. Valencia Reserve includes plenty of clubs and special interest groups. Homeowners are not only encouraged to participate, but to bring their creative ideas as well. A full-time social director and professional staff design programs and special events to help fill the social calendar. Off site, there are many ways to explore Palm Beach County and all it has to offer. Valencia Reserve is located on Boynton Beach Road, one mile west of the Florida Turnpike and nine miles from the lively center of Boynton Beach. Hospitals, golf courses, malls and shopping centers are all in close proximity. One popular shopping center is the Canyon Town Center - located within minutes of Valencia Reserve. It has banks, a post office, drugstore, and supermarket. For major shopping, the Boynton Beach Mall is only a few miles away.Valencia Reserve is only nine miles west of the closest beaches. Nature lovers will enjoy the Arthur R. Marshall Loxahatchee National Wildlife Refuge and Mangrove Nature Park - both are located in Boynton Beach. Other popular destinations in Boynton Beach include the Schoolhouse Museum, Gulfstream Park, Palm Beach Groves, Knollwood Groves, Gulfstream Dinner Theater, and Boynton Inlet. Palm Beach is 20 miles to the north and Ft. Lauderdale is 40 miles south of Valencia Reserve. Residents also have access Palm Beach Airport that's less than 20 miles away. There are plenty of activities available in Valencia Reserve. Here is a sample of some of the clubs, activities and classes offered here. The Signature Collection offers some of the smallest homes in the community with models ranging from 1,303 to 2,396 square feet. Active adults looking to downsize without losing functionality will love these homes. All models have at least two bedrooms, two bathrooms, and a two-car garage. The Vintage Collection consists of five models offering 2,182 to 2,703 square feet. These homes have two to five bedrooms, two to four bathrooms, and an attached garage. Residents love these floor plans for their elegant designs and low-maintenance exteriors. The Crown Collection offers some of the largest homes in Valencia Reserve. These models range from 2,380 to 2,861 square feet of living space with two to four bedrooms, two-and-a-half or three bathrooms, and an attached two-car garage. Some of the great features included in these models are eat-in kitchens, open floor plans, and screened patios perfect for entertaining guests. We couldn't be happier here! My husband still works and travels often so a somewhat central location still nearby to the freeways and airports was important to us. All the amenities and activities here keep me busy so I don't miss him too much while he's off on business for a few days. Even just staying in at home is a treat. Our new place is beautiful and we get tons of compliments from our house guests! We love to entertain and have all high-end appliances in the kitchen and tons of storage too. The house is great and so is the community. Come visit, you'll love it too! 55places.com is not affiliated with the developer(s) or homeowners association of Valencia Reserve. The information you submit is distributed to a 55places.com Partner Agent, who is a licensed real estate agent. The information regarding Valencia Reserve has not been verified or approved by the developer or homeowners association. Please verify all information prior to purchasing. 55places.com is not responsible for any errors regarding the information displayed on this website.